In 2015, the four leading players in the global market for automotive starter motors and alternators were Valeo Group, The Bosch Group, Denso Corporation, and Mitsubishi Electric Corporation. These companies together held a share of 34.4% in the global market during the same year, finds Transparency Market Research (TMR). The market is fragmented owing to the presence of many large and medium-sized firms competing with one another. Numerous market players are striving to offer diverse and innovative products and are bent on catering to the unmet needs of emerging markets in order to maximize profits. 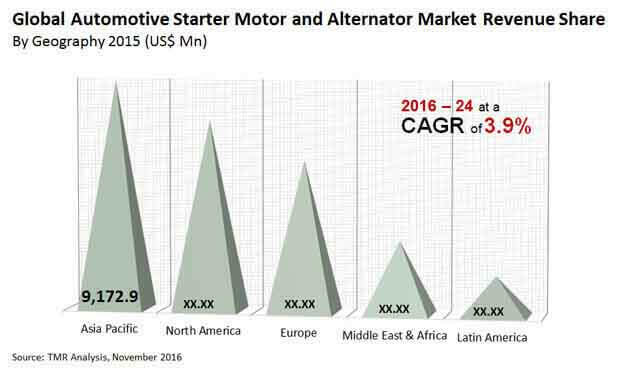 During 2015, the global automotive starter motors and alternators market was pegged at US$27.35 bn. The market is projected to advance at a conducive CAGR of 3.9% between 2016 and 2024, attaining a revenue worth US$38.56 bn by the end of the forecast period. The claw pole alternator segment is slated for significant growth, expanding at a CAGR of 3.5% during the forecast period. By region, Asia Pacific is likely to emerge as the dominant market, expanding at a CAGR of 4.6% between 2016 and 2024. Based on geography, the global market for automotive starters and alternators has been segmented into the Middle East and Africa (MEA), North America, Asia Pacific, Latin America, and Europe. The growth of the European countries such as Germany, France, and the U.K. can be attributed to factors such as registration of nearly 6000 patents in 2014 by the automotive sector, increasing use of electronic and electrical components in vehicles, and consistent R&D activities in this region. Asia Pacific holds maximum potential for expansion, suggest analysts. As this region is home to several fast-growing markets such as China, South Korea, and India, the market in Asia Pacific is likely to exhibit vast growth opportunities over the forthcoming period. Japan, owing to its spearheading advancements in technology, might represent a major portion of the global market for automotive starter motors and alternators. Growing production of vehicles has been supporting the expansion of the automotive starter motor and alternator market worldwide. As the purchasing power of the people over the globe is rising gradually, the demand for two and four wheeler vehicles has been escalating. As a result, the demand for automotive starter motors and alternators is growing, as they are important components used in the production of vehicles. A major growth driver of the market is the emergence of electric vehicles that offer eco-friendly solutions to counter the alarming rise in environmental concerns such as pollution. Moreover, a number of original equipment manufacturers (OEMs) have been focusing on the development of lighter, more fuel-efficient vehicles. On the other hand, the development of hybrid vehicles might pose a threat to the market. These vehicles do not deploy separate alternators and starter motors, instead they use combined generators or motors. This could negatively influence the demand for starter motors and alternators. However, the impact of this restraint can be negated by the robust growth in infrastructure, rapidly increasing industrialization, several government initiatives, and greater penetration of technology in Japan, China, India, Singapore, Taiwan, Cambodia, and Russia in Asia Pacific. The information presented in this review is based on a Transparency Market Research report, titled, “Automotive Starter Motor and Alternator Market (Starter Motor - Electric, Pneumatic, and Hydraulic; Alternator Type - Claw Pole Alternator and Cylindrical Alternator) - Global Industry Analysis, Size, Share, Growth, Trends and Forecast 2016 - 2024”.